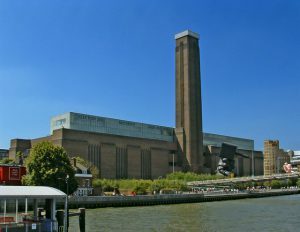 If you are having yourself a little cruise along the famous Thames river, the river that London is built around, there is little chance of you missing the Tate Modern. This museum of modern art is located right on the riverbank, in an area called Bankside in London. You cannot miss it, since the tall brick chimney which splits the art museum in half is standing out in the skyline. Just across from the Millennium Bridge, with a bunch of public transport stations around it, it is no wonder that Tate Modern is among the most popular museums in the world. Almost five million visitors find their way to Tate Modern in London, most of them leaving with vast amounts of new knowledge and thoughts. Tate Modern is far from an old building, mind you, in fact it is not even pushing one hundred! It was initially constructed as a power station and functioned as such until 1981. Now, the Tate Modern is a refurbished, modern building, even though the brick chimney has been kept in its place. Tate Modern is by all means a museum worthy of the 21st century. Within its thick walls, you will find a huge amount of entertainment, exhibitions and architectural details you most probably will not see anywhere else. You can however find a lot of art prints inspired by the art exhibited here – you could probably even make yourself a photowall with that art. One major temporary exhibition is housed in Tate Modern every year, but make sure you also check out The Tanks (oil tanks previously used ) after spending some time with the paintings. Nothing has gone to waste when the British refurbished this splendid building. Paul Klee, Picasso, Juan Gris, Robert Delaunay – Tate Modern holds a vast selection of modern art from different time periods, including some largely unknown, but wonderful pieces of art.